Updated: March 25, 2016 at 9:34 p.m. This post was written by Hatchet reporter Yueding Wang. 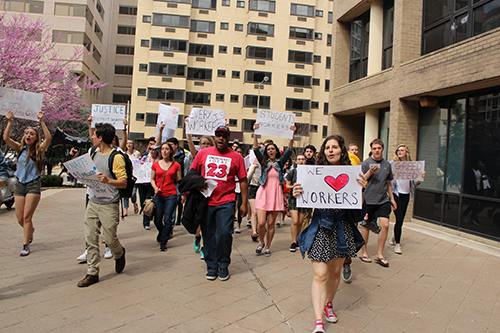 More than 60 students marched on campus Friday to demand that all current Sodexo staff remain employed during the transition to a new campus dining partner. The group of students, led by the Progressive Student Union, said the University was “ambiguous” about the fate of Sodexo staff in its announcement Monday that Restaurant Associates would take over as dining provider starting this summer. The students marched to Rice Hall, home to most of GW’s administrative offices, to deliver a petition in support of the staffers. The University said Restaurant Associates anticipated a ”reduction of fewer than 10 staff.” Restaurant Associates said it would attempt to place former employees at other company-run venues and Sodexo said it would look for opportunities for staff at other sites in the area in the announcement. Protesters from different student groups shouted “GW you can’t hide, we can see your greedy side” and other slogans during the 20 minute-long protest. “That’s not enough. We want to secure everyone who works at J Street from being fired during the transition,” Henry Klapper, a member of the PSU and a former Hatchet reporter, said. Armecia Banks, who works at J street and is a member of a committee negotiating staff employment, thanked the demonstrators for fighting for fair job commitment. The PSU said it had already received more than 1,900 signatures on a petition calling for fair jobs for J Street workers. PSU members marched to Rice Hall to send the petition to Alicia Knight, the vice president of the division of operations. She was absent from her desk by that time. The Hatchet incorrectly reported that 19,000 students signed the PSU’s petition. 1,900 students signed it. This post is also updated to include the correct chant and quote from Henry Klapper. We regret these errors.